Where breakfast and lunch meet, it should be the best of both worlds. For me, I don’t want to commit to one side all together. If I go all breakfast, the awesome looking “lunchified” dishes don’t jive with the breakfast flavors in my mouth. And vice versa. I love brunch dishes that bridge the gap between the flavors of both worlds. Could be breakfast…could be lunch…let’s just call it brunch. Being Italian, it’s instinct to turn any gathering into a party, no matter how large or small. It’s also instinct to have it revolve around food and drink. For cocktail parties, day or night, I’m a huge fan of “poppers.” One bite wonders that allow me to graze as many dishes as possible (while socializing the whole time, of course). My general goal: graceful non-stop tasting and talking for the duration. Is that possible? Hey, you gotta have a goal. Let’s take a moment to revere the magical glory of the popper. One bite of balanced flavor and texture? No small task. I’m forever working on it. My brunch, as the day-time cocktail party would be a popper-laden, drink-flowing extravaganza. With healthier, guilt-free options, of course. This recipe is dairy-free, gluten-free, vegan, and wheat-free, with options for those who aren’t! 2 tbsp almond flour or any flour if allergic to nuts, gluten-free blend, wheat, etc. Rinse quinoa. Bring water, lemon juice to a boil. Add pinch of salt and quinoa. Simmer for 16-18 minutes, until all liquid is absorbed. Grind chia seeds and let sit in 1/2 cup water. Chop green onions, garlic, mushrooms, spinach, thyme, parsley. Chop toasted almonds and chives. Toss together. Grease a 36 mini muffin tin. In a large saute pan heat olive oil over medium to medium high heat. Add onion and red pepper flakes. Add baby bella mushrooms. Cook for 4-5 minutes minutes, until tender, moving veggies around. Add garlic, spinach, and fresh thyme. Cook for 2 more minutes. Add lemon juice and sprinkle with pinch of sea salt. Taste for seasoning, adjust, and remove from heat. In a large mixing bowl, combine cooked quinoa; sautéed onion, mushroom, garlic, spinach, thyme mixture; minced parsley; lemon zest; chia seed mixture; salt and pepper. Add almond flour and cheese (vegan or regular). Stir and mix well. Distribute mixture into a greased mini muffin tin, filling each cup to the top (about 1 tbsp each). Press mixture down into tin. Bake for 18-20 minutes, until crispy on top. Unmold from muffin pans. (I use a spatula to pop them out. 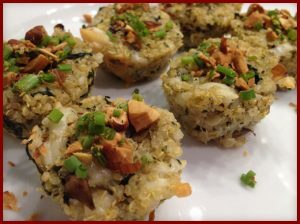 Top quinoa bites with chopped almond chive mixture and serve. Are you a one bite wonder fan so you can graze the party like me? Do you prefer the huge belgian waffle? What’s your ideal brunch dish? Maybe I’ll try to healthify it! Yes, I would call myself a “one-bite” grazer. I love to try everything at a party or gathering, but I’m always watching calories. One or two bites are usually enough. Great idea for brunch. Will have to try it. I am totally making these! I love it. I used cooked quinoa in a breakfast cookie the other day so something savory sounds wonderful! I love that you incorporate dairy free cheese too. How did it melt? Do you use Daiya or Go Veggie? I am totally intrigued by the cooked quinoa in the breakfast cookie. How was it?? I prefer Go Veggie over Daiya. I won’t say “it melts like real cheese” but it melts well, especially incorporated in foods, like a binder. I hope you love them!